Allegiance is a tricky thing. In a family or group of friends or workplace, it’s often easy to say that everybody’s working together, toward the same goal, but every single human entity that involves more than two people is going to have splinter groups. Even in a family of three, the kid’s relationship with one of his parents will be different from his relationship with the other, and those parents’ relationship will be different from the other two. This isn’t rocket science, and it’s not going to be news to anybody. But the more people you get involved in an entity, the more splinter groups can form, and the more possibility there is for everything to shatter apart into shards. To me, the most interesting thing about this third episode of Homeland is the way it depicts how Jessica Brody is already suspicious of her husband, but not necessarily suspicious that he’s a terrorist. He went away for eight years and was held captive and tortured. He changed, as he inevitably had to. It’s not that she stayed the same, but any marriage is a journey, and with the two partners on such drastically different life paths, it was inevitable there would be major problems when they returned to each other. Where Carrie looks at Brody and sees someone hellbent on destruction, Jessica looks at her husband, and you have to imagine a tiny part of her sees someone who’s hellbent on ruining what she had built in his absence. It’s not that she didn’t miss him, but she’s already mourned him. She had already moved on, and now she has to be his brave, loving wife, even when she might not want anything to do with him. 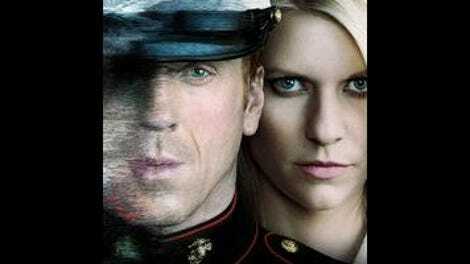 Homeland is a series, on some level, about dissension. But this doesn’t necessarily have anything to do with terrorism in tonight’s episode. The question of whether Brody has been flipped is largely back-burnered in favor of following Carrie’s doomed asset, Lynne Reid, and watching the Brody family get ready for its interview with Lawrence O’Donnell (playing himself). Sure, we get the usual bits here and there about how Brody might be a bad guy now, but the drama within the Brody household is almost completely domestic drama. And yet it’s still about dissension! The central thread is the wedge driven between Dana and her mother, and how Jessica feels a pang of something—jealousy? suspicion? anger?—when she hears Brody and his daughter laughing about silly animal videos on YouTube (something Brody’s never heard of, quite naturally). The dissension here is far more mundane, the sort of dissension we’re all familiar with. Kids always rebel against their parents—as Brody points out to Jess, she did it too at that age. But that doesn’t mean it’s any less troubling for a mother to watch her daughter seemingly turn against her. Of course, there’s another reason for Dana’s anger: She knows her mom was screwing Mike in her father’s absence. And while Jessica has perfectly good reasons for doing that (she did think her husband was dead, after all), that doesn’t make any sense to a teenager who wants to believe her mom is always the worst and her dad—newly returned war hero dad, no less—is always the best. Jessica tried to keep her relationship from her kids, but Dana was old enough to piece together what was going on. In a lovely little scene, Brody takes Dana to a fence marked with padlocks put there by couples who assumed they’d always be together. But that’s just not an assumption you can make, he tells her in so many words. Things happen. People grow apart, even if it doesn’t involve being held captive and tortured. It’s a tricky situation for everybody, and if you really love someone, you’ll cut them some slack. Does Dana get it? She’s the one who finally breaks the long silence about how Brody’s homecoming has been in the interview, but the powder keg of information she holds is still out there, waiting to go off. Another nice irony of this episode is that everything Brody says Abu Nasir tried to convince him of in captivity—including his country abandoning the search for him and his wife turning to the arms of another man—did, indeed, come true. While I continue to believe the show is giving us more nuance to Brody’s Islamic conversion beyond, “He’s a terrorist!” I also like that the show is giving him justifiable motivation to join the other side or at least give in to the brainwashing. Does your country abandoning you and your wife taking up with your best friend necessarily equal blowing up the Capitol building? Of course not. But the series is very deftly portraying how these minor personal conflicts can become earth-shattering in their importance in someone’s own head, if given long enough to fester. If Brody indeed flipped, then all Abu Nasir had to do was wait long enough and push just the right buttons. And while most people would say they couldn’t be turned against something they really believed in, it seems more likely we all have certain buttons that could be pushed, I think. “Clean Hands” is a table-setting episode. It slows down a bit from the previous two, but the story momentum doesn’t really suffer, perhaps because the Lynne Reid storyline gets such a sudden and quick conclusion. Lynne, who manages to clone the prince’s cellphone, then gets a diamond necklace from him as an expression of his apparently genuine feelings of love, dies at the hands of the prince’s right-hand man, and in a horrifying twist, it seems entirely possible that her death had nothing to do with her informing. She simply was the possessor of the necklace he needed to fund his operations, which apparently involve moving a couple—he Arabic, she Caucasian—into a house near the airport. Ominous. But if Homeland takes as its macro-level story the idea that people can turn against their country and do real harm, then its micro-level story is that people turn against each other every day and do catastrophic harm to relationships. Sure, a couple of people from Sandusky, Ohio, going to their daughter’s funeral believing that she had abandoned being the sweet girl they knew in order to pursue the luster of money isn’t nearly as big a deal as someone trying to blow up a national landmark. But to these people, it’s just as devastating. Put another way: The day before Sept. 11, I found out my grandfather had what would be diagnosed as terminal brain cancer. When I called my dad the day of the attacks, all we could talk about was my grandfather, not the events in New York. Homeland works best when it understands the personal can be just as devastating as the political, that when something really bad is happening to you, it doesn’t matter one good goddamn what’s going on out there. Our best pal the BYU grad who’s now a harem girl returns, and I have to assume she’s going to be important to the story going forward, since we saw her two weeks in a row. Is she our next Lynne Reid? Undoubtedly. My favorite scene is the one where Virgil tells Carrie he’s uncovered something “big,” then proceeds to show her that he thinks Mike and Jess are having an affair. Carrie’s disgusted, but once again, Virgil’s the audience identification figure. He’s as interested in this stuff as we are, and he likes spaghetti.